Let's start by stating up front that this is not a complaint about how much I drive, because compared to my husband who drives to and from work in a busy metropolitan area every week day, I have it easy. Compared to people who live in rural areas and must drive significant distances to reach a decent size town, we are lucky living in the suburbs with everything we could want within an easy drive. 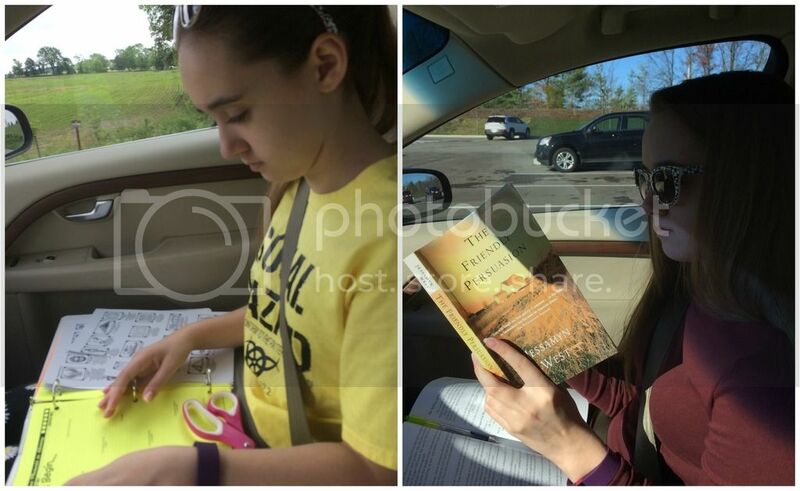 However, Amber and I do spend many hours in the car during an average week driving to her regular medical appointments where each round trip drive varies between 1 and 2 hours, plus our homeschool co-op classes that are between 40 and 50 minutes round trip (without traffic). The ultimate in drive school: an 8 hour drive to the Mayo Clinic (history timeline). Plus a regular visit to the local hospital (literature). That is a crucial amount of our available school hours lost to drive time each week. At one point we thought to use the drive as rest time for Amber, but it didn't work well except when she was so totally exhausted as she could sleep anywhere. We found the best use of this drive time to be drive-schooling. While car-schooling often refers to school while waiting in the car for a sibling, we don't have that specific need but we do spend an inordinate amount of time in a moving car. 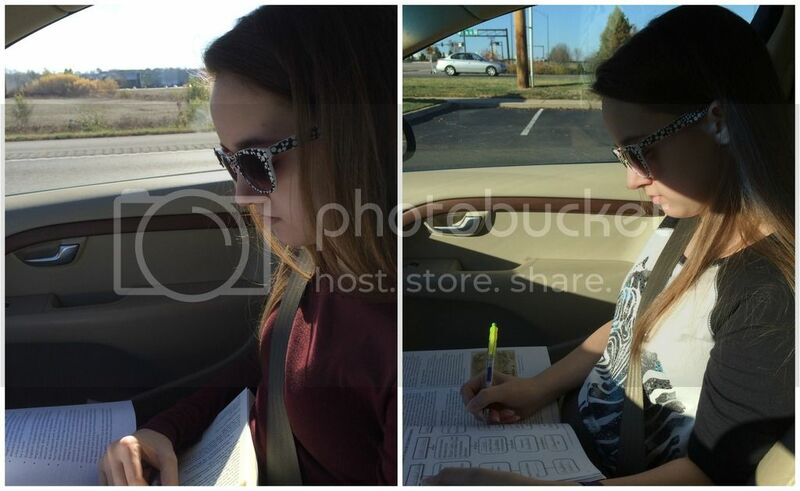 Thankfully Amber does not get carsick and has no problem reading or writing in a moving car. When we first started homeschooling I was such a rigid and unbending homeschool parent. I wanted everything to fit in a neat little school area with structured hours. I've learned over the years of homeschooling, especially since Amber developed the chronic illnesses, to simply do what works best for our situation. In the beginning, drive-schooling (or car-schooling) was not something I would even have considered, ever. More literature and history workbook. Literature - Especially reading assignments, but also analysis work. History - Again reading and analysis, but also her timeline work and supplemental workbook lessons. German - Writing or workbook assignments. She doesn't like the audio portions in the car. Writing - This one heavily depends on the type of assignment. She can do planning and editing on the go, but finds the actual writing difficult. I don't blame her either. Drive time schooling has become such second nature to Amber that she often grabs something to do even on errands around our suburb. While not ideal, this type of schooling lets us more efficiently use all of her functional hours. I can't even look at the printed word in a moving car - I feel most peculiar if I do! I think all the ingenious ways you find to homeschool according to Amber's needs are fabulous. Well done to you! We have done many, many hours of drive school over the years. My kids prefer workbook style stuff in the car. Have a lovely Thanksgiving. Good ideas - we do a lot of "car schooling" as well, and are always looking for ways to get things done while working around a crazy schedule. We live rural, so we spend a few hours in the car every week. I don't bring our "regular" school work, but we do a lot of extras like audio books and Maestro Classics. This way the little ones are getting something out of it too, and EVERYONE is quiet when there's a story going. I don't do it for all of Lauren's appointments, but I usually package up a packet of work on the days that we have either a longer drive or longer appointments so that I can count the day as an official schoolday. We also do audio books on our drives.